This one's quite famous, primarily because of the huge disco anthem 'Pyar Zindagi Hai' I think; it is indeed stellar, guaranteed to fill any discerning dancefloor. 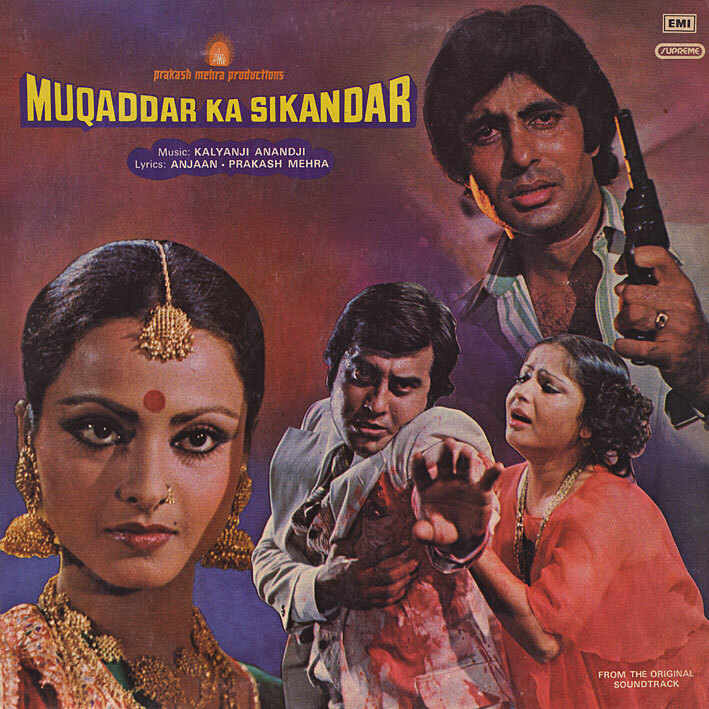 'Muqaddar Ka Sikandar' [trailer] [review] has more to offer though: 'Rote Hue Aate Hain Sab' with plenty of funky bounce, 'Zindagi To Bewafa Hai' which is a Hindi death dirge, very melodramatic, and 'O Saathi Re', the loveliest of lounge numbers (I could only find the Kishore Kumar version on YouTube; I think I prefer Asha Bhosle's though). An excellent soundtrack! Thanks for sharing the music, man! pc, you take your time, and congrats on your move. Thanks a million for this one, one of my favorite albums. For years I was after track number 8, it was not on the OSTs before, it's one of the first of many missing songs I bought from the iTMS, interestingly the DVD that was released for this film cut off the intro of that song, but included a different verse. No point in me saying what a fabulous rip, but I'm gonna say it again anyways. THANK YOU!!! For this one and all other treasures you have shared with the world. Hi - Pretty excited about hearing these albums. for some reason the links won't take me to the easy share site. any reason why it isnt accessible? The links work fine from this end - could be their servers were down for a bit when you tried it. Or you have some sort of filter or blocker installed in your browser? Hope you manage to get it working. Far from being an anthem "Pyar Zindagi Hai" is actually an obscure and maybe even despised number of the movie. The rest were huge hits during the release and even to this day. Really? Wasn't aware of that. Among latter day Bollywood enthusiasts in the West though, "Pyar Zindagi Hai" has definitely been the selling point - going down a storm in clubs. i love this one, thankU! Great score. K-A at the top of their game. love this one! fun blog! is o saathi re in another movie, too? bindifry: no idea... might be another one with the same title though? dude some true gems you are sharing with the world! heads off for digging deep and sharing. one of the best blogs I've ever come across! !